Heat oven to 350°F. Spray 40 mini muffin cups with cooking spray. In medium bowl, mix frosting and enough green food color for desired shade of green. Spoon frosting into decorating bag (fitted with desired tip) or resealable food-storage plastic bag (with small corner cut off). To assemble, pipe small amount of frosting in bottom of each push-up pop container. 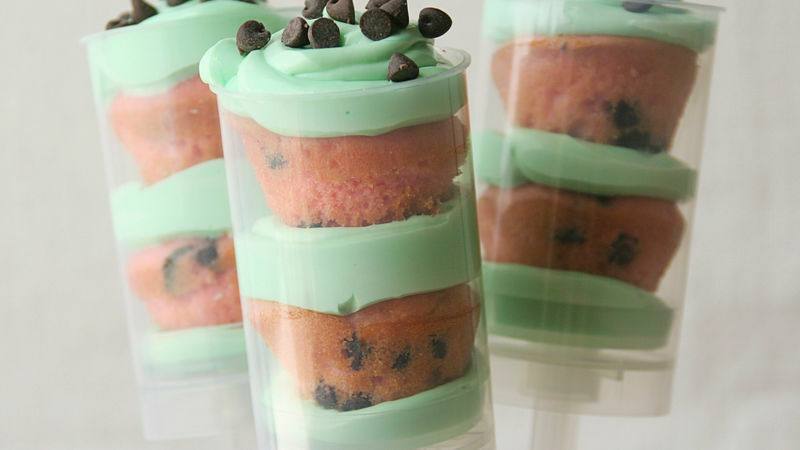 Drop 1 mini cupcake into each container; pipe frosting on cupcake. Top each with second cupcake; pipe with frosting. Add chocolate chips on top to look like watermelon seeds. Place caps on containers until ready to serve. Store in refrigerator. You can find push-up pop containers from several different online vendors or at large craft stores. To freeze cupcakes, place cooled cupcakes in single layer in airtight plastic containers or resealable freezer plastic bags. Unfrosted cupcakes can be frozen up to 3 months. Or instead of freezing the extra mini cupcakes, get another container of frosting and additional push-up pop containers to make more.